Not long ago, apropos of the film version of Eugene O’Neill’s “Strange Interlude,” I wrote an article in which I said that so far as I knew, the moving pictures had not yet turned out a play of significance, that even when the play on which the film was based had been of some importance, the screen result had not. I said also that the talkies had, temporarily at least, given a setback to the moving-picture problem; though necessary and inevitable, the addition of speech to this art has delayed its discovery of what the qualities are by which it is separate to itself, an art distinct from all other arts. The article has brought in a letter in which the good points, confusions of theory and looseness of terms with regard to this pressing and confused art seem to me so typical of most moving-picture discussions as to invite a reply. In a recent article on plays and the moving picture Mr. Stark Young stated that he had never seen a film in which the play was really important. But in the earlier part of his article he said that the final test of any artist is the “singular and pure” expression in terms of his art. If, as is generally agreed, the art of the moving picture is different from that of the theatre, how then can Mr. Young expect to find the same expression for both? Perhaps he is forgetting that the talking picture is of recent birth in comparison to the silent film. Perhaps he is also forgetting that the medium of the motion picture is not the human being but the camera, which imposes its own world of rhythms, forms and tones upon the spectator through motion recorded on celluloid strips. Of course films and plays both use acting as a means of expression, but a play is expression through direct contact with an audience and a film is mechanical and indirect contact. Consequently, to expect a film to be a good play would be to expect the film to be an imitative and completely false medium. It is perhaps unfortunate that Mr. Young stresses the significance of good theatre in the films. Drama in a film is essential as well as character, but a scenario is and should always be different from a play because the medium of the camera is first pictorial and only secondarily dramatic. There are agood many people well trained in the theatre who apply the same standards in judging films as they do in the theatre. There are also an astounding number of people who think they can judge films without knowing the first thing about them. Among these may be numbered the majority of our newspaper film critics. This is partially due to the lack of good books of film esthetics and technique, and of course to the fact that the average Hollywooden product is worthy of no better critic than the average man. The remedy for such a situation would be the establishment of a repertory theatre where the best films of all countries could be shown under competent guidance. Furthermore, courses in the history of the cinema, such as the New School for Social Research is giving this year, should be established. Institutes of Cinematography, such as the one started at the University of Southern California, should be founded in other universities and schools. Practical training for those professionally interested should he made available where the best technicians and directors could instruct in institutions similar to the Russian cinema universities. Of course the most desirable step would be the creation of independent production units away from Hollywood, similar to the Theatre Guild. Such activities would in some degree counteract the commercial Hollywooden product and would help to raise the integrity of the film medium. For certainly the film has not yet come into its own in this country. Nor will it do so unless artists and critics recognize it first as an art form and then as one with its own conditions of expression completely different from those of the theatre. I did say that the first test of any artist in any art is that all he expresses is expressed in terms, singular and pure, of the art he works in, and that this, of course, is an esthetic platitude. I did not say that I expected to find the same expression for both film and theatre. But these points we need not stay on. The argument in this letter breaks down through making ft “film” the parallel of a “play.” The art of the drama and the art of the theatre are two different things. A film is not parallel to a play but to an instance of the theatre art, a production seen on the stage, consisting of its several mediums—the play, the acting, the scene (with its settings, lights and costumes) plus, if you like, the audience and music, when there is music. Instead of the medium of actual presence (of scenes and actors) the film employs the medium of the camera. The camera we see on the screen is as much a medium as the actor-scene presence we see on the stage. If this were not so, we should have to regard the film as only a photograph of the acting and scenery, which would be to deny its claims as a separate and distinct form of art. The instance of theatre art— not the “play,” which is only a part of it—is, as Miss Naumburg says, “expression through direct contact with an audience”; so far as the film is an art at all, it also is. Only when the film is not an art is its contact with the audience “mechanical and indirect.” Within this film medium (complete in itself) its contributing elements (mediums in themselves, the play, the acting, the décor) must find their terms of expression, as they have done already, more or less, in the theatre. There is no such thing in art as an indirect medium. The point at the moment, however, involves neither the play nor the theatre art. The point is that the relation, in the film, of the actor and the scene to the whole, is different from the relation, in the theatre art, of the actor and the scene to the whole. With that straight we can go on with the subject. In both the art of the film and the art of the theatre the play takes its place as a part of the whole, in a proportion that varies according to the case, sometimes more acting or more scenery and less play, sometimes vice versa. I was speaking not of the theatre but of the play as a part of the film. The contrast is not between “pictorial” and “dramatic.” It is between camera and actual presence (scene and actors.) Obviously it would be only stupid to judge a moving picture and a theatrical production as if they were both the same art; we are dealing with two mediums, not with one. But this affects only the medium in which the play appears, it has nothing to do with “standards” of judgment. As to Miss Naumburg’s comment on the average film critics, the error lies in thinking them worse than the average critic in any other art. They would be equally bad critics of the theatre. The average critic merely tells us what sort of a time he had, or at least observed the people around him having, which is one way of judging. He has no knowledge, in the first place, of the fact that every art employs its own language, into which the material it employs must be translated before we have art at all. Looking at acting, for example, he watches for what seems natural, or something of that sort, and is blind to the fact that it is only when the actor’s self and the character and the actions have been restated in acting terms that we have any acting at all. You will notice that he will applaud a facile, lively piece of self-excitement or exhibited self in the actor (which in a sense is right, since the element of personality is a main element in acting). You will notice him applaud stunts, places where the performer is going off into mere skill (and there also in a sense he is right, since art, or at least technique, is admitted). But you will see him less certain about the combination of these two, some performance in which the actor regulates his personality to his role and by his art separates himself from purely naturalistic imitation. In sum, not only every art, but every style in that art, has its language, and the average critic nowadays knows only one: the language of the most obvious realistic imitation or type-cast reproduction. How many critics, movie or theatre, know anything about music or ever hear it? As if music were not the prime basis of all film and all theatre art, which begins with the dance (the basis of the actor’s gesture and stage line) and proceeds onward to the spoken words and to the rhythm of emotions and dramatic emphasis, the pause and forward movement, throughout the whole occasion! Concerning schools, lectures, guilds, institutions and esthetic treatises as means of solving the problems and providing the understanding and remedies for the film art, I can only agree with Miss Naumburg by saying that the same is true of all our arts. As for the film’s not having come into its own in this country, I am not sure what we are to mean. We are not speaking of the popular arrivals, surely. It may be true that music, literature and even the theatre are taken more seriously than the films are and by people of somewhat superior culture or approach. But as to ubiquity, patronage, fans and popularity, the films left the theatre behind years ago; and the stage in fact has drawn fewer as the moving picture drew more, though it cannot be said that the theatre gets much less patronage than it deserves. It compares, indeed, none too favorably with what it was seven or eight years ago. As for the film’s coming into its own artistically, we have bad, these past few years, moments in our theatre—Miss Pauline Lordin the first act of “Mariners,” Miss Dorothy Stickney as the cracked charwoman in “Chicago,” the highly perfected rapport in comedy scenes of Mr. Alfred Lunt and Miss Lynn Fontanne, for example—that have been remarkable. But there have been moments in the films, meanwhile, quite as good as any of these. There has been, moreover, in the film an artist who surpasses all these. 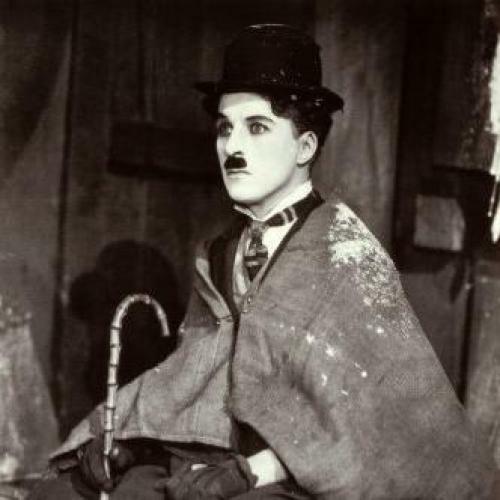 In pure abstraction as regards movement and characterization, in poetry, security and myth, Charlie Chaplin has left the whole theatre far behind him and has created the one thing, in film or theatre, that has gone from America all over the world. It is of course obvious that the film has not come into its own in possibility of expression, in purity of medium and in the definition of its terms as an art. With Miss Naumburg’s last sentence I cannot agree. The film art, certainly, must be, as she says it is, a distinct art form. But its “conditions of expression” are not “completely different from those of the theatre.” On the contrary it is exactly the overlapping in the elements that compose the theatre and the film that has made it so hard for both creators of films, as well as the critics and the public, to determine just what are the elements by which the film is an art distinct to itself. Those overlapping elements appear in other arts besides the theatre and film. Literature and painting and sculpture with regard to narrative, for example, afford a situation that causes no end of misplaced judgment. A picture may be admired for the story told in it, which, though legitimate enough to the painter’s art, has not in the particular picture been translated into painting terms. A statue that has diverse painting values to be admired may yet not be sculpture at all in any basic sense. Music and architecture alone among the arts are spared this misplacement: each of these we read in its own terms. To go on with our point about the film and theatre, it is highly likely that some of the most admired moments, or scenes, in the films have arrived not through any translation into the art involved or any essentially film quality, but rather in spite of the film. They were largely mere records of stage events, ordinary photographs of extraordinary matter. We may note that it is also rendered harder for the film to determine the full nature of its medium by the fact that realism prevails. The freedom, varieties of stylization and so on possible to the camera are hampered by the prejudice just now for naturalistic methods and effects. Release from such limitations appears now and again on the screen, especially in the most notable German films; but for the most part the film—as does the theatre art—limits its attitude, its acting, scene and mood to the likeness and habit of prose actualities.